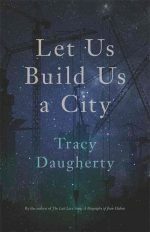 LET US BUILD US A CITY reads like a master class on writing as practice, while performing a deep reading of art and life and looking to discern why liberal education matters so much to our society. At its core, this is a work of cultural and literary history, combining memoir (of the author’s experiences as a student and teacher of literature and writing) with analysis and speculation. Daugherty exploits a variety of forms to explore literary apprenticeship and mentoring, philosophy, politics, metaphysics, and American history. A stirring defense and timely renewal of our national literary vision.